I have a love/hate relationship with Moon Sand. For those of you who haven't encountered this strange substance, it feels like sand with some properties of play-doh. 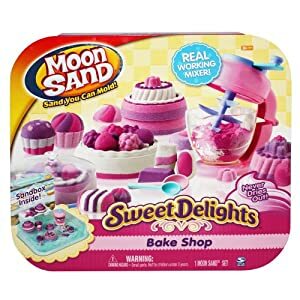 Unlike the real deal, you can mold Moon Sand without adding water. Although it doesn't quite hold a sturdy shape (it is sand, after all), little ones love to roll it into balls, cut out shapes and use their imagination to make all sorts of creations. It also doesn't dry out which gives it a one-up over play-doh in my book. The Moon Sand people make a plethora of sets to choose from. They all come with a plastic sheet to make clean-up easier and, depending on the set, sometimes even an inflatable tray with raised sides to assist with the mess. The sets are nice because they lend to some symbolic play, but with a free form material like this your children will love letting their creativity show. 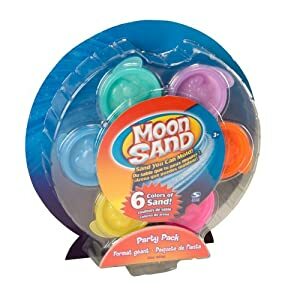 You can also just buy the Moon Sand and use your own sand toys that are taking a break in storage for the summer. Here is a sand toy set that I had at home that makes ice cream cones. Your little ones will love bringing the beach indoors on a cold winter day! I, of course, encourage you to get in on the fun and join your child in some messy play. I, frankly, find some catharsis in playing with sand. 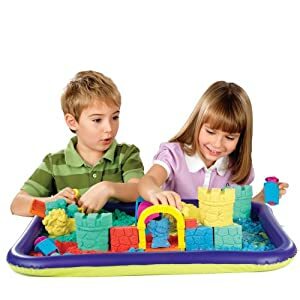 If your child has any tactile defensiveness, this is a wonderful activity to help ease your child into a new tactile experience without the unpredictability of sand from the beach. 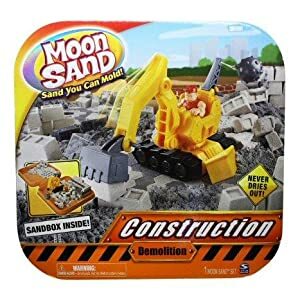 There are no surprises with Moon Sand and what better way to support your child in, what is to them a scary tactile experience, by doing it with them?